Multidrug resistance protein 1 (MRP1) is a broad-specificity membrane transporter belonging to the C branch of the ATP binding cassette (ABC) superfamily. MRP1 confers resistance to various chemotherapeutic drugs and transports a wide range of conjugated organic anions. Several ABCC proteins, including MRP1, are unusual among ABC transporters in having a third membrane-spanning domain (MSD), MSD0, at their N termini. MRP1 lacking this additional MSD (ΔMRP1) is able to traffic to the plasma membrane of mammalian cells and to transport a number of well characterized substrates. A cysteineless (cysless) ΔMRP1 has been expressed in yeast and reported to be functional. However, we found that trafficking of such a construct in human cells was severely compromised, and, even when expressed in insect Sf21 cells, the protein had extremely low transport activity. Therefore, we have systematically examined the effects of substituting cysteines in the four domains of ΔMRP1, initially with alanine. These studies allowed us to identify five cysteines that cannot be replaced with alanine without inactivating the protein. Substitution of two of these residues with alternative amino acids has allowed us to produce an almost cysless form of ΔMRP1 that traffics to the plasma membrane and transports leukotriene C4, 17β-estradiol 17-β-d-glucuronide, and estrone-3-sulfate with kinetic characteristics similar to those of the wild-type protein. The distribution of the remaining Cys residues is such that the protein will provide a useful template for a variety of cysteine based mutagenesis studies. Multidrug resistance protein (MRP) 1 was identified in a multidrug-resistant derivative of the human small cell lung cancer cell line, H69 (Cole et al., 1992). The protein can confer a drug resistance profile similar to that of P-glycoprotein and has been detected in many forms of cancer, including common solid tumors (Cole et al., 1992; Pascolo et al., 2000; Faneyte et al., 2004; Rybárová et al., 2004; Deeley et al., 2006). However, unlike P-glycoprotein, MRP1 can also transport a wide range of organic anions (for review, see Deeley et al., 2006). MRP1/ABCC1 is a member of the C branch of the ABC transporter superfamily, 10 members of which have been designated as MRP-related. The three additional members include the cystic fibrosis conductance regulator (CFTR/ABCC7) and the sulfonylurea receptors (SURs/ABCC8 and 9) (Deeley and Cole, 2003). Most ABC transporters contain two membrane-spanning domains (MSDs). However, MRP1, 2, 3, 6, and 7 and the SURs have an extra NH2-terminal MSD (MSD0). This extra MSD contains five putative TM helices and is linked to the core structure of the protein by a cytoplasm loop CL3 (also known as L0) (Deeley and Cole, 2003). In SUR1, the domain interacts with the inwardly rectifying K channel Kir6.2 and is required for the protein to exit the endoplasmic reticulum (Babenko and Bryan, 2003; Chan et al., 2003). In MRP2, MSD0 is required for the protein to traffic to the apical membrane and to function (Fernández et al., 2002). In MRP1, some mutations in this domain interfere with protein trafficking and activity (Westlake et al., 2005). However, after deletion of the entire domain to amino acid 204, the core of MRP1 (ΔMRP1) can traffic to basolateral membranes and is able to transport various substrates (Bakos et al., 1998). Structure-function studies of MRP1 have relied extensively on functional analyses of mutated proteins and the use of various photoactivateable ligands to identify regions and individual amino acids involved in substrate binding (Loe et al., 1996; Qian et al., 2001, 2002; Haimeur et al., 2002, 2004; Mao et al., 2002; Zhang et al., 2002, 2003, 2004; Karwatsky et al., 2003; Wu et al., 2005). With other ABC proteins, such as P-gp and CFTR (Loo and Clarke, 1995, 1997; Taylor et al., 2001; Loo et al., 2003a,b; Rothnie et al., 2004; Cui et al., 2006), cysteine-scanning mutagenesis has proven to be a powerful tool for investigating protein structure. Such studies of MRP1 have yet to be performed and present a significant challenge because the protein contains 25 cysteines, 7 of which are in MSD0. Mutation of the cysteine residues in this domain have been shown previously to abrogate trafficking to the PM. However, a cysteineless (cysless) form of ΔMRP1 has been expressed in yeast and found to transport LTC4 (Lee and Altenberg, 2003). As yet, there has been no demonstration of whether or not cysless ΔMRP1 expressed in animal cells can traffic to the plasma membrane and function. Such information is required to provide assurance that the higher order structure of the cysteineless protein does not differ significantly from that of wild-type ΔMRP1. Thus, we expressed cysless ΔMRP1 in both HEK293 cells and insect Sf21 cells. We found that the cysless protein failed to exit the endoplasmic reticulum (ER) in HEK293 cells, and transport activity of cysless ΔMRP1 expressed in Sf21 cells was less than 20% that of the wt protein. To investigate how alanine substitution of various cysteine residues affects maturation of ΔMRP1 in HEK293 cells, chimeric proteins were created by systematically swapping four different domains of the cysless and wt protein. Among these constructs, we identified two that maintain 50% of wt LTC4 transport activity and contain as few as six cysteines. Further mutagenesis in a chimera containing wt CL3, MSD1, and NBD2 fragments created a five-cysteine construct, 5cys ΔMRP1, which trafficked to the plasma membrane at physiological temperature (37°C) and displayed transport kinetics very similar to those of wt ΔMRP1. Substituting two of the remaining cysteines with alternative amino acids allowed us to generate a protein containing only three cysteines, which traffics to plasma membrane and transports various substrates with the kinetic characteristics of wild-type ΔMRP1. Identification of these three cysteine residues, which are critical for the function of ΔMRP1, will enable future studies of their role in the folding, trafficking, and transport activity of the protein, as well as facilitating the application of a wide variety of cysteine-based mutagenesis studies aimed to validate the predicted tertiary structure of MRP1 and the conformational changes believed to occur during its transport cycle. Radioactive [14,15,19,20-3H]LTC4 (165.7 Ci/mmol) was purchased from GE Healthcare (Chalfont St. Giles, Buckinghamshire, UK). [6,7-3H] E217βG (45 Ci/mmol) and [6,7,-3H]E13SO4 (57.3 Ci/mmol) were obtained from PerkinElmer Life Sciences (Waltham, MA). Unlabeled LTC4 was purchased from Calbiochem (San Diego, CA). E217βG, E13SO4, ATP, AMP, stable HEK293 cell-selective antibiotic G-418, and anti-calnexin antibody were purchased from Sigma-Aldrich (St. Louis, MO). Dulbecco's modified Eagle's medium and fetal bovine serum were obtained from Invitrogen (Carlsbad, CA). Anti-human MRP monoclonal antibody QCRL1 was made in our laboratory, and MRPr1 was purchased from Enzo Life Sciences, Inc. (Lausen, Switzerland). Fluorescence-labeled secondary antibodies goat anti-rabbit Alexa Fluor 594, goat anti-rat Alexa Fluor 488 and chicken anti-rat Alexa Fluor 594 and fluorescent dye Hoechst 5000 were purchased from Invitrogen. Horseradish peroxidase-labeled secondary antibodies were purchased from Thermo Fisher Scientific (Waltham, MA). FuGENE 6 and Complete EDTA-free protease inhibitors were purchased from Roche Applied Science (Indianapolis, IN). All primers used in this study are synthesized by ACGT Ltd. (Toronto, ON, Canada). Generation of a Cysless ΔMRP1 Construct. Wild-type ΔMRP1 was cloned in pCDNA3.1(−) and pFastBac1 (Invitrogen) as described previously (Westlake et al., 2003). Mutagenesis primers for making cysless ΔMRP1 are displayed in Table 1. In brief, mutations were generated using the Transformer Site-Directed Mutagenesis kit (Clontech, Mountain View, CA) in shuttle vectors pGEM-3Zf (Promega, Madison, WI). The cysless ΔMRP1 was then cloned back into pCDNA3.1 to generate pMRP1CL204–1531, which was for expression of the protein in HEK293 cells. To express cysless ΔMRP1 in Sf21 insect cells, the open reading frame was recovered from pMRP1CL204–1531 by digestion with KpnI and PmeI and cloned into pFastBAC1 (Invitrogen) to create pFBMRP1CL204–1531. Primers 1 to 18 were used to construct cysless ΔMRP1. Primers 19 to 22 were used to prepare the MRP11–203wt/204-1531cysless protein. + and − ahead of the name of restriction enzymes indicate sites that were introduced or deleted in the primers. Construction of a Chimeric MRP1 Containing Wild-Type MSD0 (aa 1–203) and cysless C-Terminal Region (aa 204-1531). Recombinant polymerase chain reaction (Higuchi, 1990) was used to construct a hybrid DNA encoding wt aa 1–203 and cysless aa 204-1531 of MRP1, i.e., MRP11–203WT/204-1531CL, for expression in HEK293 cells. In the first step, primer1 (5′ ATAGGTACCGCCGCCATGGCGCTCCGGGGCTTCTGCAGCGC 3′) and primer 2 (5′ GGATTAGGGTCGTGGATGGTTTCCGAGAACAG 3′) were used to amplify the first 620 nucleotides) of wild-type MRP1 from pFB-MRP1(Gao et al., 1996). A KpnI site (underlined) and a consensus Kozak sequence (italic) were introduced in primer 1 for DNA cloning and protein expression in mammalian cells. Primer 3 (5′ GAAACCATCCACGACCCTAATCCCGCCCCAGAG 3′) and primer 4 (5′ GGCAGGATCCTTGGAGGAGTACACAACCTTCACC 3′) were used to amplify the 5′ terminal nucleic acid sequences from cysless template pMRP1CL204–1531. Primer 2 and 3 have overlapping sequences of 23 nucleotides (double underlined), and both primer sequences are located in the region between cysteine residues C190 and C208. Primer 4 contains the exclusive endogenous BamHI site (underlined) in the MRP1 open reading frame that was used for subsequent cloning of restriction fragments. A two-step recombinant PCR process was performed as described previously (Westlake et al., 2005). The final DNA fragment was digested with KpnI and BamHI and inserted into vector pMRP1CL204–1531 to generate pMRP11–203WT/204-1531CL. Generation of wt-Cysless Chimeric ΔMRP1 Constructs. Four restriction enzymes were selected with single sites in the open reading frame of ΔMRP1 as indicated in Fig. 3. Vectors encoding chimeric proteins were created by exchanging equivalent restriction DNA fragments between expression vectors for wt and cysless ΔMRP1 using standard cloning procedures. Details of the resultant chimeras are summarized in Table 2. On the basis of the results of studies with the various chimeric proteins, a construct containing only five cysteine residues (Cys208, Cys375, Cys388, Cys1439, and Cys1479) was generated by Ala substitution of cysteines at positions 265, 555, 563, 1299, and 1423 in the vector encoding ΔMRP1617-1295cysless (Table 2). This construct was designated 5cys ΔMRP1. Mutations were introduced using the primers listed in Table 1, initially in ΔMRP1 DNA subcloned DNA in pBluescript KSII(+) vector (Fermentas Life Sciences, Waltham, MA) DNA fragments containing individual Cys to Ala substitutions were then cloned back to the ΔMRP1617-1295cysless DNA backbone to create 5cys ΔMRP1. 3cys ΔMRP1 was generated from the 5cys ΔMRP1 construct by replacing C208 and C375 with serine and isoleucine, respectively, using the Transformer Site-Directed Mutagenesis Kit (Clontech) in pGEM-3Zf (Promega) shuttle vectors. Cell Culture and Protein Expression in HEK293 or Sf21 Cells. To establish stable HEK293 transfectants, approximately 3 to 5 × 105 cells were seeded in each well of a six-well plate (Sarstardt, Nümbrecht, Germany) the day before transfection, whereas for transient expression studies approximately 10 × 106 cells were seeded in 150-mm plates (Sarstardt). After 24 h, cells reached 50 to 80% confluence and were transfected with DNA using FuGENE 6 (Roche Diagnostics), as described in the manufacturer's instructions. Stable cell lines were selected with 1 mg/ml G418 and maintained with 0.5 mg/ml G418 in Dulbecco's modified Eagle's medium. To express wt and cysless ΔMRP1 proteins in Sf21 cells, pFastBac vectors encoding various constructs were used to transform DH10BAC Escherichia coli competent cells to derive recombinant Bacmids, which were then used to prepare recombinant virus for expression of MRP1 proteins in Sf21 cells, as described previously (Gao et al., 1996). Plasma Membrane Trafficking and Glycosylation of Full or Partial cysless Constructs. Confocal studies were performed with stable expression HEK293 cells. In brief, cells were fixed with 90% ethanol (precooled at −70°C), and MRP1 protein was detected using MRPr1 monoclonal antibody as described previously (Westlake et al., 2003). To determine whether nascent MRP1 molecules are stacked in ER, calnexin, a marker for the ER, was detected with rabbit anti-calnexin antibody. Alexa 488 or 594 fluorescent secondary antibodies were used to label MRP1 and calnexin protein, respectively. Nuclei were stained with Hoechst (1:5000), and cells were examined under a Leica TCS SP2 MS multiphoton confocal microscope (Leica Microsystems, Wetzlar, Germany). To modify the PM traffic of fully or partly alanine-substituted ΔMRP1 protein in HEK cells, stable expression HEK293 cells were grown either at 37 or 28°C to compare the differences in their PM trafficking. To rescue PM traffic of cysless protein, wt MSD0 of MRP1 was also expressed either transiently in cysless protein expressing HEK293 cells or stably in a form of integrated full-length MRP1 protein with cysless ΔMRP1 in HEK293 cells. In the case of coexpression of CFP-tagged wt MSD0 and cysless ΔMRP1, the cysless protein was detected with MRPr1 mAb and Alexa 594 fluorescent secondary antibody. Membrane vesicles containing various ΔMRP1 proteins were treated with PNGase F or Endo H (New England Biolabs, Ipswich, MA) following the instructions of the manufacturer. After treatment, protein samples were diluted in SDS-PAGE loading buffer and resolved with SDS-PAGE. Proteins were then transferred onto Immobilon-P film (Millipore Corporation, Billerica, MA) and immunoblotted with MRPr1 primary antibody and secondary antibody as described previously (Westlake et al., 2003). The observed band shift after glycosidase treatment serves as an indicator of the type and extent of glycosylation. Membrane Vesicle Preparation and Drug Transport Assays. Plasma membrane vesicles of HEK293cells and Sf21 cells were prepared as described previously with minor modifications (Loe et al., 1996). In brief, cells were disrupted by nitrogen cavitation (250 psi), and membrane vesicles were collected from centrifugation through sucrose. Finally membrane vesicles were spun down at 55,000 rpm, resuspended, aliquoted, and stored at −70°C. Expression levels of wt and mutant ΔMRP1 proteins were determined by immunoblotting and densitometry analysis as described previously (Zhang et al., 2001b). In brief, the Western blotting procedure was used to detect protein samples using QCRL1 (Hipfner et al., 1994) or MRPr1 (Bakos et al., 1998; Westlake et al., 2004) as the primary antibody. Densitometry was performed using a ChemiImager 4000 (Alpha Innotech, San Leandro, CA) to determine the relative MRP1 protein concentration. Relative protein expression levels were normalized from two independent Western blotting experiments. Mean values were used to normalize protein concentration in transport assays. Drug transport activity of cysless ΔMRP1 was determined with Sf21 membrane vesicles, and the drug transport activity of all wt-cysless chimeras was assessed with membrane vesicles from HEK293 cells. Drug uptake assays using these inside-out membrane vesicles were performed as described previously (Loe et al., 1996; Stride et al., 1999; Zhang et al., 2001a). A one time point [3H]LTC4 (25 nCi/reaction) uptake assay was performed at 23°C in a 25-μl solution containing 50 nM LTC4 (labeled and unlabeled), 4 mM ATP (or 4 mM AMP in the control group), 10 mM MgCl2, and 2 to 5 μg of vesicle protein, depending on expression levels. The reaction was stopped at 1 min by rapid dilution with 1 ml of ice-cold transport buffer (pH 7.4) and filtered through glass fiber filters (type A/E; Pall Life Sciences, Ann Arbor, MI). Finally, radioactivity was measured by liquid scintillation counting. ATP-dependent drug uptake was determined by subtracting uptake in the presence of AMP from uptake in the presence of ATP. All transport assays were performed in triplicate, and results are expressed as mean ± S.D. Kinetics of Drug Transport by wt, 5cys ΔMRP1, and 3cys ΔMRP1 Constructs. Kinetic studies were performed to determine the Km and Vmax values of transporting LTC4 and E217βG and [3H]E13SO4 with wt and 3cys ΔMRP1 proteins in HEK293 membrane. For LTC4 transport, substrate concentrations ranging from 25 to 500 nM, 4 μg of total protein (2 μg of wt protein plus 2 μg of control membrane vesicles or 4 μg of 3cys ΔMRP1), and other essential components described above were mixed in a volume of 25 μl. After incubation at 23°C for 1 min, the reaction was stopped with quick dilution, filtered, and followed by liquid scintillation counting. As to E217βG transport, the assay was performed in a similar way while the vials were incubated at 37°C containing 0.2 to 8 μM E217βG, 4 μg of total protein, and other components described above in a 25-μl reaction. Likewise, [3H]E13SO4 transport was performed using concentrations ranging from 0.75 to 16 μM with the addition of 2 mM S-methyl GSH. After a 1-min incubation, the reaction was stopped to perform radioactivity determination. For each concentration of LTC4, E217βG, or [3H]E13SO4, at least three parallel experiments were performed, and the results are represented as mean ± S.D. Data were analyzed using GraphPad Prism 4 (GraphPad Software Inc., San Diego, CA), and kinetic parameters were determined by linear regression analysis of a Hanes-Wolff plot. Level of Expression of 3cys ΔMRP1 and Photoaffinity Labeling of ΔMRP1 and 3cys ΔMRP1 with [3H]LTC4. Chimeric ΔMRP1 containing Cys388, Cys1439, and Cys1479 was stably expressed in HEK293 cells. To maximize expression of the mutant protein, the cells were grown to near confluence at 37°C and then cultured at 28°C in the presence of 50 mM sodium butyrate for 16 h. Levels of expression of 3cys ΔMRP1 were compared with ΔMRP1 maintained under culturing conditions by Western blotting using mAb MRP1 and quantified by densitometry analysis similar to the procedure described above. Samples containing 25 and 50 μg of either ΔMRP1 or 3cys ΔMRP1 in a 50 μl-reaction volume were mixed with 10 mM MgCl2 and [3H]LTC4 (200 nM, 0.13 μCi) and incubated for 30 min at room temperature. After freezing in liquid nitrogen, samples were cross-linked at 302 nm for 1 min. The freezing and cross-linking cycle was repeated nine more times. The cross-linked proteins were then resolved by electrophoresis through SDS-PAGE. The gel containing the cross-linked proteins was fixed, processed for fluorography by soaking in Amplify (GE Healthcare), dried, and exposed to X-ray film for 14 days. Creation of cysless ΔMRP1 (Amino Acids 204-1531) and Its Expression in HEK293 Cells. Figure 1A shows a cartoon of the predicted topology of ΔMRP1 and positions of the 18 cysteine residues that were replaced with alanine (Bakos et al., 1996; Deeley et al., 2006). Consistent with previous results (Bakos et al., 1998; Westlake et al., 2005), confocal microscopy indicated that wt ΔMRP1 was localized primarily in the PM of stably transfected HEK293 cells. However, cysless ΔMRP1 was retained entirely in intracellular membranes (Fig. 1B). Immunoblotting of total membrane protein from transfected cells after SDS-PAGE indicated that the expression level of the cysless protein was considerably lower than that of wt ΔMRP1. Furthermore, the apparent molecular mass of the cysless protein was approximately 10 kDa less than that of wt ΔMRP1 (Fig. 1C). PNGase F treatment decreased the apparent molecular mass of wt ΔMRP1 without affecting that of the cysless protein, and, after treatment, both proteins comigrated during SDS-PAGE with an apparent molecular mass of 150 kDa. Thus, we conclude from confocal imaging and deglycosylation studies that the cysless mutant is not processed through the Golgi compartment and probably fails to exit the ER. Topology and expression of wt and cysless ΔMRP1. A, predicted topology of ΔMRP1 indicating the positions of alanine substitutions of naturally occurring cysteine residues and the position of N-glycosylation in MSD2. B, confocal immunofluorescence images of wt and cysless ΔMRP1 stably expressed in HEK 293 cells. Cells were fixed with 95% ethanol and incubated with mAb MRPr1 and Alexa 488 goat anti-mouse secondary antibody (green signal), as described under Materials and Methods. C, Western blotting of membrane proteins from HEK transfectants expressing wt (2 μg of total membrane protein) and cysless (10 μg of total membrane protein) ΔMRP1 incubated without or with PNGase F and probed with mAb QCRL1, as described under Materials and Methods. Trafficking of cysless ΔMRP1 Cannot Be Rescued by Growing Cells at Lower Temperature or by Coexpression with wt MSD0. In previous studies, it has been shown that certain mutant CFTR and MRP1 proteins that fail to exit the ER at 37°C were able to traffic to the plasma membrane when cells were grown at lower temperature, e.g., 27°C (Denning et al., 1992; Westlake et al., 2004). Therefore, we evaluated the trafficking of cysless ΔMRP1 at both 37 and 28°C by confocal microscopy using calnexin as a marker of the ER. As shown in Fig. 2A, cysless ΔMRP1 was retained in the ER at both temperatures. Effect of low temperature or expression of wt MRP1 MSD0 on the subcellular localization of cysless ΔMRP1 in HEK 293 cells and LTC4 transport activity of cysless ΔMRP1 expressed in insect Sf21 cells. A, cysless ΔMRP1 was expressed in stable HEK transfectants at both 37°C (top left panel) and 28°C (top right panel). Cells were fixed with 95% ethanol and incubated with mAb MRPr1 and Alexa 488 goat anti-mouse secondary antibody (green fluorescence) to detect cysless ΔMRP1. The cells were also stained with rabbit anti-calnexin polyclonal antibody and Alexa 594 goat anti-rabbit secondary antibody (red fluorescence) to provide a marker for the endoplasmic reticulum. Stable HEK transfectants expressing cysless ΔMRP1 were also cotransfected with a vector expressing CFP-tagged wt MRP1 MSD0 (bottom left panel), which displayed normal trafficking to the PM (blue fluorescence) but failed to rescue cysless ΔMRP1. Likewise, a fusion protein containing wt MRP1 MSD0 connected to cysless ΔMRP1 failed to traffic to the plasma membrane (bottom right panel). B, Western blot of membrane proteins from Sf21 cells expressing wt (2 μg of total membrane protein) and cysless (3 μg of total membrane protein) ΔMRP1 using anti-MRP1 mAb QCRL1 as the primary antibody. The relative levels of wt and cysless ΔMRP1 were determined by densitometry and used to normalize the results of LTC4 transport studies. C, LTC4 uptake by membrane vesicles from infected Sf21 cells was measured as described and normalized on the basis of densitometry of Western blots. The results shown are the mean ± S.D. of triplicate determinations in a typical experiment. Three independent experiments were performed with similar results. As an alternative approach, we examined the ability of wt MRP1 MSD0 (amino acids 1–203) to rescue the PM trafficking of cysless ΔMRP1. We have shown previously that some ΔMRP1 mutants that fail to exit the ER are able to do so when coexpressed with wt MSD0, which can traffic independently to the PM (Westlake et al., 2005). Initially, we coexpressed MRP1 MSD0 tagged with CFP at its COOH-terminal end (MSD0-CFP) with cysless ΔMRP1. Although MSD0-CFP trafficked independently to the plasma membrane, as observed previously, the cellular distribution of cysless ΔMRP1 was unaltered (Fig. 2A, bottom left). We also created a full-length hybrid protein in which wt MSD0 was connected to cysless ΔMRP1 and expressed the hybrid in HEK293 cells. However, the wt MSD0/cysless ΔMRP1 protein was also retained in the ER (Fig. 2A, bottom right). Overall, these observations indicate that the cysless core of the protein is unable to adopt a native conformation, regardless of the presence or absence of native MSD0. Activity of cysless ΔMRP1 Is Significantly Impaired Compared with That of the wt Protein. To assess the functional consequences of eliminating cysteines from ΔMRP1, we expressed the mutant protein in insect Sf21 cells, which we have shown to be capable of expressing a number of MRP1 mutants that fail to traffic and are poorly expressed in mammalian cells (Westlake et al., 2003, 2004). Membrane vesicles were prepared from infected cells and the ability of cysless ΔMRP1 to transport LTC4 was compared with that of the wt protein. Unlike HEK293, infected Sf21 cells expressed both wt and cysless ΔMRP1 at comparable levels with no apparent difference in size, as expected given the low level of glycosylation observed in the insect cells (Fig. 2B). However, after normalization, LTC4 uptake by vesicles containing the cysless protein was only ∼20% that of wt ΔMRP1 (Fig. 2C). Thus, substitution of all cysteine residues in ΔMRP1 results in a major decrease in transport activity, as well as in a loss of the ability to traffic appropriately in mammalian cells. These results are contrary to those obtained when a similar construct was expressed in yeast and was reported to be transport-competent for LTC4 (Lee and Altenberg, 2003). Identification of Cysteine Residues Required for Trafficking of ΔMRP1 in HEK293 Cells. To identify cysteine residues that are critical for the folding and trafficking of ΔMRP1 in mammalian cells, we created a series of expression vectors for cysless-wt chimeric proteins by exchanging restriction fragments encoding various wt or alanine-substituted structural domains (Fig. 3). The nomenclature and composition of these chimeras are summarized in Table 2. Illustration of the restriction fragments used to create expression vectors encoding the various chimeric wt and cysless ΔMRP1 proteins described in the text and in Table 2. The positions of the first and last amino acids encoded by each fragment, as they exist in full-length MRP1, are indicated at the bottom of the figure. First, we examined cellular trafficking of chimeras containing only a single cysless domain in stably transfected HEK293 cells. These chimeric proteins differed in their ability to traffic to the PM (Fig. 4A). Colocalization of the chimeras with calnexin was used to assess the extent of ΔMRP1 retention in the ER, which appeared to be highest in constructs containing either an NH2-terminal (204–282) or COOH-terminal (1295–1531) cysless region (Fig. 4A). In contrast, elimination of the eight cysteines in NBD1 and MSD2 has no apparent effect on PM localization. As an additional indicator of the ability of the constructs to exit the ER, membrane proteins were treated with glycosidases (PNGase F and Endo H) and examined by SDS-PAGE and immunoblotting. The apparent molecular weight of all four chimeric proteins was reduced by PNGase F treatment but not by Endo H, as observed with wt ΔMRP1 (Fig. 4B). Thus, all four constructs appear to contain complex N-linked carbohydrate and, consequently, unlike the cysless protein, are competent to transit the Golgi. Comparison of the trafficking and glycosylation of ΔMRP1 hybrids containing a single cysless domain. A, hybrid proteins were expressed at 37°C in stably transfected HEK293 cells, and their subcellular localization was determined by fluorescence confocal microscopy after fixation and immunostaining with mAb MRPr1 and Alexa 488 goat anti-rat secondary antibody (green fluorescence). Calnexin was stained with rabbit anti-calnexin polyclonal antibody and Alexa 594 goat anti-rabbit secondary antibody (red fluorescence) at the same time. B, membranes prepared from transfected HEK293 cells were compared by SDS-PAGE before and after treatment with PNGase F or Endo H. The gel was then immunoblotted using mAb MRPr1 plus horseradish peroxidasse goat anti-rat antibody. The amounts of total proteins analyzed by SDS-PAGE were adjusted to contain a similar amount of the various wt/cysless ΔMRP1 hybrids, based on prior immunoblotting and densitometry. FG indicates the migration position of fully glycosylated ΔMRP1 band, and DG indicates the position of the protein after treatment with PNGase F. For ease of identification and comparison, the lanes for ΔMRP1cysless and ΔMRP1 are indicated by one and two asterisks, respectively. Based on immunoblotting and densitometry, expression levels of these chimeric proteins in HEK transfectants grown at 37°C ranged from 45 to 85% of wt ΔMRP1 (Fig. 5A, left panel). The normalized LTC4 transport activity of three of the constructs ranged from 60 to 100% that of wt ΔMRP1 (Fig. 5B, top panel). The activity of ΔMRP1204-282cysless containing the C208A and C265A mutations was most dramatically affected and was decreased by ∼70% (Fig. 5B, top panel). Subsequently, we found that LTC4 transport activity of the C208A and C265A double mutant could be substantially recovered by growth of the HEK transfectants at 28°C (Fig. 5B, bottom panel). Growing HEK293 cells at the lower temperature also enhanced the ability of this mutant protein to traffic to the PM (Fig. 5C). Thus, at physiological temperature, substitution of cysteines in CL3 had the most profound effects on PM trafficking and function. Characterization of LTC4 transport activity of hybrid wt/cysless ΔMRP1 proteins containing a single cysless domain. A, immunoblots of wt and wt/cysless ΔMRP1 proteins expressed in HEK393 cells at 37°C (a) or 28°C (b) detected using mAb QCRL1 and horseradish peroxidase goat anti-mouse secondary antibody. 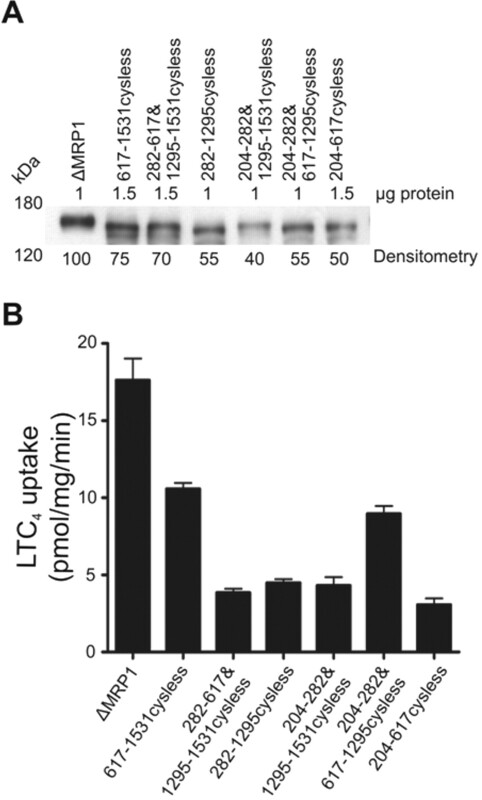 Densitometry data derived from the immunoblot were used to normalize the results of LTC4 by membrane vesicles from the same transfectants shown in B. ATP-dependent uptake was measured for 3 min at 23°C in the presence of [3H]LTC4 (50 nM, 20 nCi). C, the subcellular distribution of ΔMRP1204–282cysless and calnexin in HEK transfectants grown at both 37 and 28°C was determined by fluorescence confocal microscopy, as described in the legend to Fig. 4. We next examined the ability of constructs containing two cysless domains to traffic to the PM. Chimeras representing all six possible combinations of wt and cysless fragments were stably expressed in HEK293 cells grown at either 37 or 28°C. At 37°C, only the construct containing both wt NH2- and COOH-terminal fragments (i.e., ΔMRP1282-1295cysless) was able to exit the ER (Fig. 6B). However, PM trafficking of all six constructs could be rescued to a greater or lesser extent if they were expressed at 28°C. To confirm this, chimeric proteins expressed at 28°C were subjected to digestion with PNGase F and Endo H treatment. Unlike wt ΔMRP1, which is completely resistant to Endo H treatment, the chimeras were deglycosylated by both enzymes, indicating that they were only core-glycosylated. The exception was ΔMRP1282-1295cysless. As indicated above, this construct was able to traffic to the PM at 37°C although only a minor fraction of this construct was Endo H-resistant (Fig. 6A, middle panel). Confocal microscopy of the subcellular distribution of two reciprocal constructs, ΔMRP1282–1295cysless and ΔMRP1204–282&1295–1531cysless, is shown in Fig. 6B. In contrast to ΔMRP1282–1295cysless, ΔMRP1204–282&1295–1531cysless was not detected in PM at 37°C and was only marginally observed in the cell membrane at 28°C. Confocal micrographs of four other constructs were similar to those of ΔMRP1204–282&1295–1531cysless (data not shown). Effects of cysteine-alanine substitution in two of four ΔMRP1 fragments on protein glycosylation and PM trafficking in HEK293 cells. A, immunoblot of ΔMRP1 proteins in HEK293 cell membranes without or with PNGase F and Endo H treatment detected by mAb MRPr1 after the Western blotting procedures as described under Materials and Methods. The amounts of membrane proteins loaded in SDS-PAGE gel were adjusted to contain similar amounts of ΔMRP1 molecules among different samples by immunoblots performed earlier. Fully glycosylated, core-glycosylated, and deglycosylated ΔMRP1 bands are labeled FG, CG, and DG, respectively For ease of identification and comparison, the lanes for ΔMRP1cysless and ΔMRP1 are indicated by one and two asterisks, respectively. B, a pair of reciprocal chimeric ΔMRP1 constructs, ΔMRP1282–1295cysless and ΔMRP1204–282&1295–1531cysless, were expressed in HEK293 cells at 37 and 28°C. Chimeric ΔMRP1 proteins were immunologically detected with mAb MRPr1 and Alexa 488 goat anti-rat secondary antibody (green signal), with calnexin in the ER probed by rabbit anti-calnexin polyclonal antibody and Alexa 594 goat anti-rabbit secondary antibody (red signal), as described. Last, we investigated the trafficking of constructs with a single wt fragment. All of these constructs failed to exit the ER, regardless of whether cells were grown at 37 or 28°C (data not shown). Immunoblotting and deglycosylation studies confirmed that all of the constructs were unglycosylated at both 28 and 37°C (data not shown). Thus, they displayed the same characteristics as the completely cysless protein. 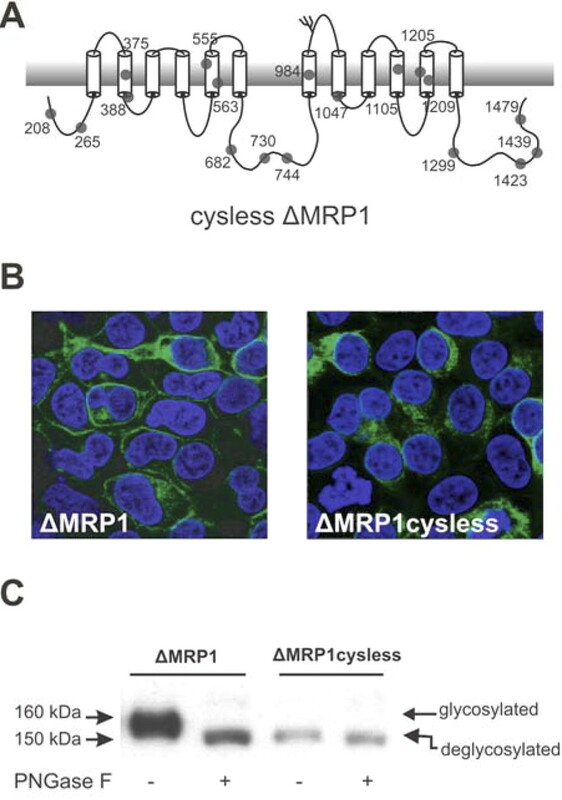 Overall, these studies suggest that the effect of the cysteine mutations on protein folding is cumulative and that residues in both terminal regions of ΔMRP1 may be particularly important for its maturation in mammalian cells. Evaluation of the Effect of Multicysteine Substitution on LTC4 Transport Activity. Chimeric ΔMRP1 proteins that were at least partially glycosylated and able to traffic to the PM at 28°C (Table 2, constructs 6–11) were tested for their ability to transport LTC4. Immunoblotting and densitometry showed that expression levels of the six relevant constructs ranged from 40 to 55% of wt ΔMRP1 (Fig. 7A). After normalization, two chimeras containing a wt MSD1 and either a wt CL3 (NH2 terminus) or a wt NBD2 (COOH terminus) displayed the highest LTC4 transport activity, i.e., 50 to 60% of the wt protein (Fig. 7B). Although ΔMRP1282–1295cysless was the only chimera containing more than one cysless region that was able to traffic to the PM at both 37 and 28°C, its LTC4 transport activity was only 25 to 30% that of wt ΔMRP1 (Fig. 7B). Thus, the ability of the protein to traffic to the PM is not necessarily indicative of its functional state. Characterization of the LTC4 transport activity of chimeric ΔMRP1 proteins containing two of four cysless peptide fragments. A, immunoblot of membrane vesicles prepared from transiently transfected HEK293 cells grown at 28°C expressing the chimeric constructs indicated in the figure, detected with mAb QCRL1 as described. Chemiluminescent signals were compared by densitometry and are shown as a percentage of the expression level of wt ΔMRP1. B, membrane vesicles were incubated at 23°C with 50 nM LTC4 (20 nCi [3H]LTC4) for 1 min, as described. ATP-dependent LTC4 uptake data were normalized for differences in protein expression levels as indicated in A. To further characterize the two most active, partially cysless proteins, i.e., ΔMRP1617–1531cysless and ΔMRP1204–282&617–1295cysless, we studied their kinetics of LTC4 and E217βG transport. Consistent with the single time point assay, time course analyses of LTC4 and E217βG transport revealed similar rates of transport by both chimeras, approximately 60% that of wt ΔMRP1 for both substrates (data not shown). The Km and Vmax values of these cysless proteins are shown in Table 3. Derivation of a 5cys ΔMRP1 with Normal PM Traffic and LTC4 Transport Activity. Overall, the results of the above studies using constructs with either one or two cysless fragments indicated that the substitution of cysteines in MSD1 resulted in significant decreases in LTC4 transport activity and that cysteines in the NH2- and COOH-terminal regions of ΔMRP1 were important for the ability to traffic to the PM. Therefore, we determined the effect of additional single alanine substitutions of cysteines in ΔMRP1617–1295cysless or ΔMRP11295–1531cysless on PM trafficking (data not shown). These studies allowed us to generate a construct containing five cysteines (Cys208, Cys375, Cys388, Cys1439, and Cys1479), designated as 5cys ΔMRP1, that retained the ability to traffic to the PM. Stable HEK293 cells expressing 5cys ΔMRP1 were grown at 37 or 28°C, and PM trafficking was assessed by confocal microscopy. PM localization of 5cys ΔMRP1 was observed at both temperatures with some accumulation in the ER when cells were cultured at 37°C (Fig. 8A). The relative expression level of 5cys ΔMRP1 in membrane vesicles was determined to be approximately 75% of wt ΔMRP1 when both proteins were expressed at 28°C (Fig. 8B). The Km and Vmax values for LTC4 and E217βG transport by membrane vesicle from the stable transfectants of 5cys ΔMRP1 were similar to those of wt ΔMRP1 (Table 3). Plasma membrane traffic and transport activity of chimeric ΔMRP1 construct containing five cysteines. A, chimeric ΔMRP1 containing Cys208, Cys375, Cys388, Cys1439, and Cys1479 was expressed in HEK293 cells at 37 and 28°C. 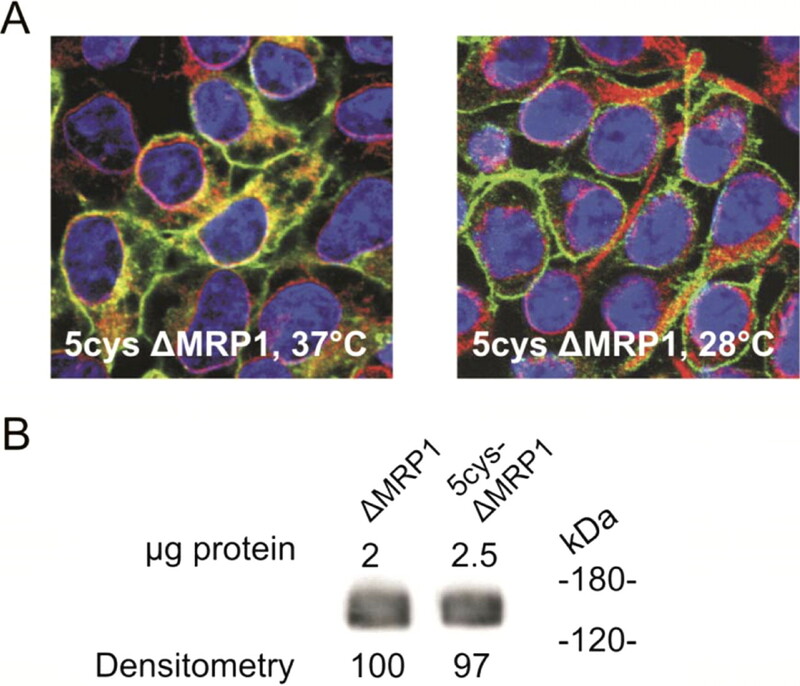 Cells grown on coverslips were fixed with ice-cold 95% ethanol (−70°C), and the expression of the 5cys ΔMRP1 proteins was detected with mAb MRPr1 and Alexa 488 fluorescent secondary antibody. At the same time, the ER was monitored with polyclonal antibody rabbit anti-calnexin and Alexa 594 secondary antibody as described under Materials and Methods. Cellular localization of ΔMRP1 was observed using confocal microscopy. 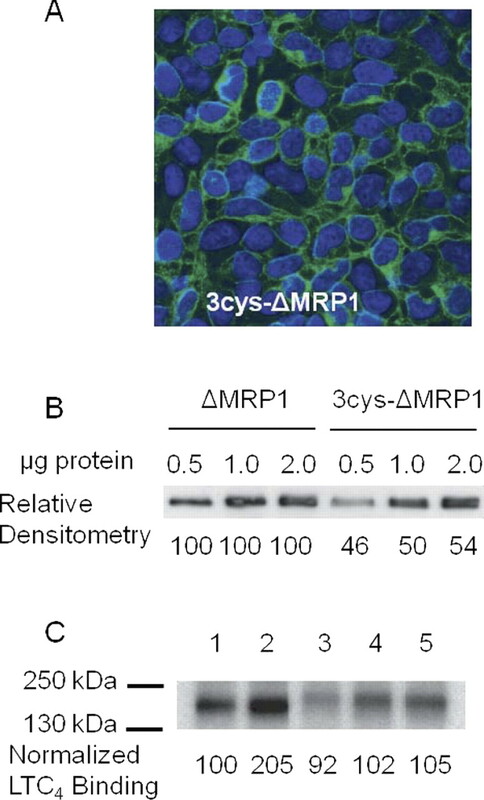 B, expression levels of 5cys ΔMRP1 were compared with those of wt ΔMRP1 by Western blotting using MRPr1 as the primary mAb and quantified by densitometry analysis as described. Generation of a ΔMRP1 Containing Three Cysteine Residues That Traffics to the Plasma Membrane and Transports Various Substrates with Kinetic Characteristics Comparable to Those of the Wild-Type Protein. Attempts to further reduce the number of cysteine residues by substitution of any one of the remaining five with alanine resulted in substantial decreases in activity (results not shown). Thus, we examined the conservation of the five remaining cysteines among members of the ABCC family to search for other possible substitutions that may be better tolerated than alanine (Fig. 9). Based on these analyses, we found that it was possible to substitute the less conserved C208 and C375 with serine and isoleucine, respectively, to yield a construct with three cysteines (3cys ΔMRP1). Confocal microscopy and SDS-PAGE indicated that PM localization of 3cys ΔMRP1 was similar to that of wt ΔMRP1 and that the protein was fully glycosylated (Fig. 10, A and B). Immunoblotting and densitometry indicated that the 3cys protein was expressed at a level that was approximately 50% that of wt ΔMRP1 (Fig. 10B). In addition, photolabeling studies indicated that 3cys ΔMRP1 bound LTC4 as efficiently as ΔMRP1 (Fig. 10C). To examine the functional characteristics of 3cys ΔMRP1, we determined the Km and Vmax values for transport of LTC4, E217βG, and E13SO4, three well characterized MRP1 substrates. As summarized in Table 3, the Km and normalized Vmax values of 3cys ΔMRP1 for all three substrates were very similar to those of wt ΔMRP1. Multi-alignment of members of the human ABCC subfamily illustrating the conservation or lack thereof of cysteines 208, 375, 388, 1439, and 1479. The alignment was initially performed with the entire sequences of the ABCC proteins indicated using ClustalW followed by editing using BioEdit (http://www.mbio.ncsu.edu/BioEdit/bioedit.html) (Hall, 1999). h, human. Level of expression of 3cys-ΔMRP1 and photoaffinity labeling of ΔMRP1and 3cys ΔMRP1 with [3H]LTC4. A, chimeric ΔMRP1 containing Cys388, Cys1439, and Cys1479 was stably expressed in HEK293 cells. To maximize expression of the mutant protein, the cells were grown to near confluence at 37°C and then were cultured at 28°C in the presence of 50 mM sodium butyrate for 16 h. Cells grown on coverslips were fixed with 95% ethanol (−70°C), and the levels of expression of 3cys ΔMRP1 proteins were detected with mAb MRP1 and Alexa 488 fluorescent antibody as described under Materials and Methods. Cellular localization of 3cys ΔMRP1 was monitored using confocal microscopy. B, levels of expression of 3cys ΔMRP1 were compared with those of wt ΔMRP1 maintained under similar culturing conditions by Western blotting using mAb MRP1 and quantified by densitometry analysis as described under Materials and Methods. Pairwise comparisons of an identical amount of membrane proteins from the wt ΔMRP1- and 3cys ΔMRP1-expressing cells were determined. The densitometry signals obtained at each concentration of the wt protein were arbitrarily set at 100. C, photoaffinity labeling of ΔMRP1and 3cys ΔMRP1 with [3H]LTC4 was determined as described under Materials and Methods. Lanes 1 and 2 were loaded with 25 and 50 μg of total membrane protein containing wt ΔMRP1, respectively. Lane 3 was loaded with 25 μg of membrane protein containing 3cys ΔMRP1, and lanes 4 and 5 were each loaded with 50 μg of a similar sample. Quantification of the [3H]LTC4 binding by wt ΔMRP1 and 3cys ΔMRP1 was determined by densitometry. Densitometry results were then corrected for the ∼2-fold higher expression for the wt ΔMRP1 as determined by Western blotting. The normalized LTC4 binding data are shown, and the signal for 25 μg of membrane protein containing wt ΔMRP1 is arbitrarily set at 100. MRP1 is unusually rich in cysteine residues, and mutagenesis of individual cysteines in the NH2-terminal region has been shown to affect trafficking of MRP1 in mammalian cells, as well as substrate specificity (Leslie et al., 2003; Yang et al., 2003). The importance of the remaining 18 cysteines for the expression and function of MRP1 has not been examined systematically. In a preliminary study, we found that substitution of all 25 cysteines in MRP1 with alanine resulted in a protein that failed to traffic in mammalian cells and was inactive in insect Sf21 cells (D. W. Zhang, unpublished data). However, a cysless, N-terminally truncated form of the protein lacking MSD0, ΔMRP1, has been reported to be functional when expressed in yeast (Lee and Altenberg, 2003). Therefore, we examined the trafficking and transport activity of a similar construct expressed in HEK293 and insect Sf21 cells. We found that this construct did not traffic appropriately in HEK293 cells and was expressed at a very low level compared with that of wt ΔMRP1. Confocal laser microscopy indicated that the cysless ΔMRP1 colocalized with the ER marker, calnexin, strongly suggesting that the protein was misfolded or had become dependent on trafficking signals in MSD0 (Westlake et al., 2005). To examine the latter possibility, we coexpressed cysless ΔMRP1 with wt MSD0, which has been shown to rescue trafficking of some mutant forms of ΔMRP1 lacking C-terminal trafficking signals (Westlake et al., 2005). However, this approach failed to rescue trafficking of the cysless protein, as did growth at lower temperatures. In contrast to HEK293 cells, expression of cysless ΔMRP1 in Sf21 cells was comparable to that of wt protein (Fig. 2B), but its LTC4 transport activity was only 10 to 20% that of wt ΔMRP1 (Fig. 2C). Thus, folding of the protein appears to be seriously impaired in both mammalian and insect cells. In some cases in which cysless membrane proteins have been found to be nonfunctional, the loss of activity was attributed to a progressive increase in cysteine substitution, rather than mutation of any particularly critical cysteine (Pajor and Sun, 1999; Hu et al., 2000; Tanaka et al., 2004). In MRP1, single cysteine substitutions in the N-terminal regions, MSD0 and CL3, had various relatively modest effects on expression and function of the full-length protein in HEK293 cells (Leslie et al., 2003). To examine whether the inability of cysless ΔMRP1 to traffic and to transport LTC4 was caused by single or multiple cysteine substitution, we constructed a series of cysless and wt chimeras (Fig. 3; Table 2). Chimeras lacking cysteines in one of four regions that together spanned the length of ΔMRP1 were able to traffic to the PM of HEK293 cells. However, the reciprocal constructs containing only one wt region were retained in the ER (data not shown). Experiments using chimeras containing various permutations of two wt and two cysless regions revealed the importance of cysteine residues in both NH2- and COOH-terminal regions of ΔMRP1 for PM trafficking and the importance of cysteines in MSD1 for transport activity. Thus, the chimera ΔMRP1282–1295cysless containing two cysteines in CL3 and four cysteines in the C-terminal tail (spanning NBD2) was the only construct capable of trafficking to the PM of HEK293 cells grown at 37°C. This result is consistent with previous studies that have demonstrated the importance of both regions for the folding and trafficking of ΔMRP1 (Westlake et al., 2003, 2004). Using glycosylation and PM trafficking data as indicators of protein processing and targeting, we assessed those chimeras that met both criteria (fully or partially) for their LTC4 transport activity. Although ΔMRP1282–1295cysless was the only construct that trafficked to the PM at 37°C, its LTC4 transport activity was only 25% that of wt ΔMRP1. In contrast, ΔMRP1617–1531cysless and ΔMRP1204–282&617–1295cysless retained approximately 50% of wt transport activity but were only able to traffic to the PM when expressed at 28°C. A common feature of these two constructs is that they share a wt MSD1. In support of the importance of cysteines in MSD1 for LTC4 transport activity, elimination of only the cysteines in this domain decreased LTC4 transport by approximately 40%. By making individual Cys/Ala substitutions in a construct containing a cysless NBD1 and MSD2, we were able to eliminate cysteine residues at positions 265, 555, 563, 1299, and 1423 to generate a construct that contained only five cysteines and retained full LTC4 and E217βG transport activity. Two of the five remaining cysteines are highly conserved among ABCC proteins, and we were unable to identify substitutions of these two residues that did not compromise trafficking and/or activity. The functional importance of one of them has already been demonstrated. C1439 is located in the COOH proximal half of an extended Signature C motif in NBD2. It is completely conserved in NBD2 of the ABCC proteins, which is the predominant catalytically active NBD (Fig. 9) (Hall, 1999). In contrast, the most common amino acid found at the corresponding site in NBD1, which displays much lower or no catalytic activity, is serine. We have shown previously that mutation of C1439 to serine compromises LTC4 transport activity (Qin et al., 2008). C1479 is also conserved in all MRPs except MRP7 and in CFTR. However, it is possible to substitute either alanine or serine for the corresponding residue in CFTR in an otherwise cysless background and to retain function (Mense et al., 2006). Why this is not the case with MRP1 is not yet known. The three remaining cysteines, C208, C375, and C388, are relatively unconserved (Fig. 9). We have shown that C208 is located at the NH2-terminal functional boundary of a region in cytoplasmic loop 3 (CL3) of full-length MRP1 that is required for basolateral trafficking in polarized Madin-Darby canine kidney I cells (Westlake et al., 2003). However, it was possible to replace this residue with serine as opposed to alanine with no loss of activity. The current molecular model of ΔMRP1 is based on the ADP vanadate-trapped, low-affinity state of Sav1866 (DeGorter et al., 2008). In the model (Fig. 11), Cys375 in TM7, which we were able to replace with isoleucine with no loss of transport activity, is predicted to be located approximately midway through the membrane and to project away from the putative translocation pore into the lipid bilayer. In contrast, Cys388, is predicted to be close to the membrane/cytosol interface in TM7 (Fig. 11) and to project toward the putative translocation pore. We have previously shown that amino acids in a number of TMs, including TM6 and TM7 that are located near the membrane/cytosol interface, influence substrate specificity and/or overall activity. Nonconservative mutation of Lys319 in TM6, which is predicted to be immediately adjacent to Cys388 in the Sav1866 model, selectively decreases the transport of GSH (Haimeur et al., 2004), whereas a comparable mutation of Lys396 in TM7 decreases transport of a range of substrates. Furthermore, TM7 has been identified by mass spectrometry as a site of photolabeling by LTC4. Therefore, we examined the effect of single substitutions of Cys388 in wt ΔMRP1 on the ability to transport LTC4 and E217βG. Substitution of Cys388 with seven different amino acids (C388D, C388G, C388I, C388M, C388N, C388S, and C388V) decreased the transport of LTC4 by 30% (C388V) to more than 90% (C388N). Their effect on E217βG transport was similar although the C388V mutation reduced transport by only 10 to 15% (data not shown). 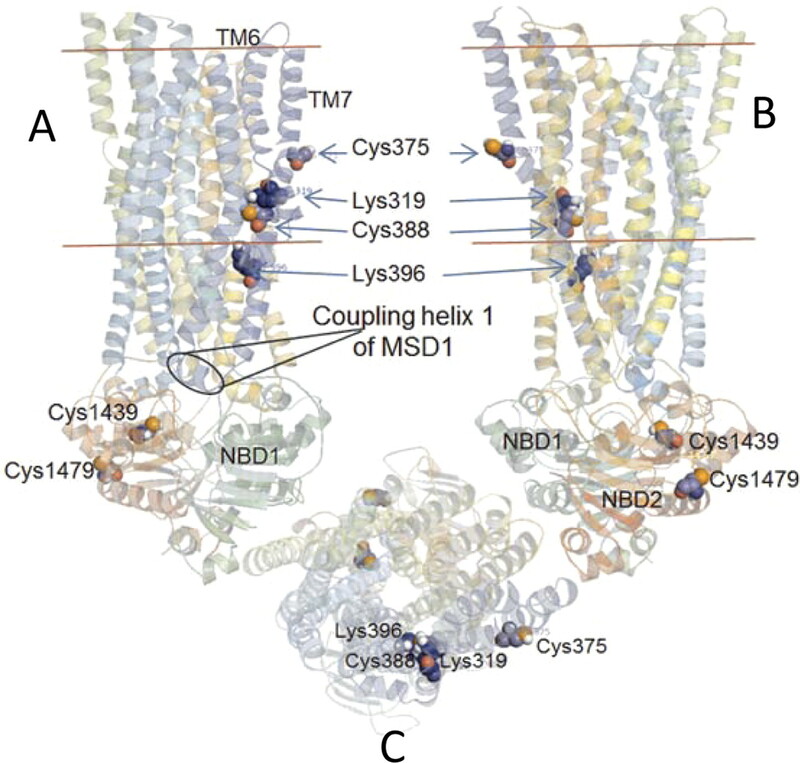 Because TM7 is predicted to connect with coupling helix 1 of MSD1 (DeGorter et al., 2008), analogy with other ABC transporters suggests that orientation of residues such as Cys388 may respond to changes in the positioning of the NBDs during the transport cycle, which in turn influence rotation and tilt of helices forming the translocation pore. The figure illustrates three views of the model of MRP1 based on the crystal structure of the ADP-bound form of Staphylococcus aureus Sav1866 generated as described previously (DeGorter et al., 2008) and produced using PyMOL (DeLano Scientific LLC, San Carlos, CA). The locations of cysteine residues and certain amino acids in TM6 and TM7, referred to in the text, are indicated. A and B, two views from the plane of the membrane, rotated by approximately 90° relative to each other, with the two faces of the membrane indicated by orange lines. The positions of TM6, TM7, and coupling helix 1 in MSD1, which connects TM7 and TM8, are also shown. C, view from the extracellular face of the membrane to illustrate the disposition of residue side chains relative to the putative translocation pore. Despite the inability to substitute these remaining three cysteines with alternative residues, the functionally well characterized 3cys ΔMRP1 will provide a valuable template for cysteine-based mutagenesis studies aimed to validate the helix packing predicted by the current model of ΔMRP1, detecting alterations in this packing between high- and low-affinity substrate binding states and determining the accessibility of various regions of the putative translocation pore to membrane impermeable and membrane soluble sulfhydryl probes. Participated in research design: Qin, Tam, and Deeley. Conducted experiments: Qin and Tam. Performed data analysis: Qin, Tam, and Deeley. Wrote or contributed to the writing of the manuscript: Qin, Tam, and Deeley. We thank Ruth Burtch-Wright and Monika Vasa for excellent technical assistance and Maureen Hobbs for assistance with manuscript preparation. This work was supported by the Canadian Institutes of Health Research [Grant MOP-97877] (to R.G.D.). (2003) Sur domains that associate with and gate KATP pores define a novel gatekeeper. J Biol Chem 278:41577–41580.
. (1998) Functional multidrug resistance protein (MRP1) lacking the N-terminal transmembrane domain. J Biol Chem 273:32167–32175. (1996) Membrane topology and glycosylation of the human multidrug resistance-associated protein. J Biol Chem 271:12322–12326. (2003) N-terminal transmembrane domain of the SUR controls trafficking and gating of Kir6 channel subunits. EMBO J 22:3833–3843. (1992) Overexpression of a transporter gene in a multidrug-resistant human lung cancer cell line. Science 258:1650–1654. (2006) The role of cystic fibrosis transmembrane conductance regulator phenylalanine 508 side chain in ion channel gating. J Physiol 572:347–358. (2003) Multidrug resistance protein 1 (ABCC1), in ABC Proteins: From Bacteria to Man (Holland IB ed) pp 393–422, Elsevier Science, New York. (1992) Processing of mutant cystic fibrosis transmembrane conductance regulator is temperature-sensitive. Nature 358:761–764. (2008) Molecular modeling of the human multidrug resistance protein 1 (MRP1/ABCC1). Biochem Biophys Res Commun 365:29–34. (2004) Multidrug resistance associated genes MRP1, MRP2 and MRP3 in primary and anthracycline exposed breast cancer. Anticancer Res 24:2931–2939. (2002) Role of the N-terminal transmembrane region of the multidrug resistance protein MRP2 in routing to the apical membrane in MDCKII cells. J Biol Chem 277:31048–31055. (1996) Reconstitution of ATP-dependent leukotriene C4 transport by co-expression of both half-molecules of human multidrug resistance protein in insect cells. J Biol Chem 271:27782–27787. (2004) Mutations of charged amino acids in or near the transmembrane helices of the second membrane spanning domain differentially affect the substrate specificity and transport activity of the multidrug resistance protein MRP1 (ABCC1). Mol Pharmacol 65:1375–1385. (2002) Charged amino acids in the sixth transmembrane helix of multidrug resistance protein 1 (MRP1/ABCC1) are critical determinants of transport activity. J Biol Chem 277:41326–41333. (1990) A guide to methods and applications, in PCR Protocols (Innis MA, Gelfand DH, White TJ eds) pp 177–183, Academic Press, San Diego, CA. (1994) Detection of the Mr 190,000 multidrug resistance protein, MRP, with monoclonal antibodies. Cancer Res 54:5788–5792. (2000) Expression of an active Na,K-ATPase with an α-subunit lacking all twenty-three native cysteine residues. J Biol Chem 275:30734–30739. (2003) Binding of a photoaffinity analogue of glutathione to MRP1 (ABCC1) within two cytoplasmic regions (L0 and L1) as well as transmembrane domains 10–11 and 16–17. Biochemistry 42:3286–3294. (2003) Transport of leukotriene C4 by a cysteine-less multidrug resistance protein 1 (MRP1). Biochem J 370:357–360. (2003) Functional and structural consequences of cysteine substitutions in the NH2 proximal region of the human multidrug resistance protein 1 (MRP1/ABCC1). Biochemistry 42:5214–5224. (1996) Multidrug resistance protein (MRP)-mediated transport of leukotriene C4 and chemotherapeutic agents in membrane vesicles. Demonstration of glutathione-dependent vincristine transport. J Biol Chem 271:9675–9682. (2003a) Substrate-induced conformational changes in the transmembrane segments of human P-glycoprotein. Direct evidence for the substrate-induced fit mechanism for drug binding. J Biol Chem 278:13603–13606. (2003b) Simultaneous binding of two different drugs in the binding pocket of the human multidrug resistance P-glycoprotein. J Biol Chem 278:39706–39710. (1995) Membrane topology of a cysteine-less mutant of human P-glycoprotein. J Biol Chem 270:843–848. (1997) Drug-stimulated ATPase activity of human P-glycoprotein requires movement between transmembrane segments 6 and 12. J Biol Chem 272:20986–20989. (2002) GSH-dependent photolabeling of multidrug resistance protein MRP1 (ABCC1) by [125I]LY475776. Evidence of a major binding site in the COOH-proximal membrane spanning domain. J Biol Chem 277:28690–28699. (2006) In vivo phosphorylation of CFTR promotes formation of a nucleotide-binding domain heterodimer. EMBO J 25:4728–4739. (1999) Protein kinase C-mediated regulation of the renal Na+/dicarboxylate cotransporter, NaDC-1. Biochim Biophys Acta 1420:223–230. (2000) Detection of MRP1 mRNA in human tumors and tumor cell lines by in situ RT-PCR. Biochem Biophys Res Commun 275:466–471. (2002) Photolabeling of human and murine multidrug resistance protein 1 with the high affinity inhibitor [125I]LY475776 and azidophenacyl-[35S]glutathione. J Biol Chem 277:35225–35231. (2001) Characterization of binding of leukotriene C4 by human multidrug resistance protein 1: evidence of differential interactions with NH2- and COOH-proximal halves of the protein. J Biol Chem 276:38636–38644. (2008) Residues responsible for the asymmetric function of the nucleotide binding domains of multidrug resistance protein 1. Biochemistry 47:13952–13965. (2004) The topography of transmembrane segment six is altered during the catalytic cycle of P-glycoprotein. J Biol Chem 279:34913–34921. (2004) Expression of the multidrug resistance-associated protein 1 (MRP1) and the lung resistance-related protein (LRP) in human lung cancer. Neoplasma 51:169–174. (1999) Localization of a substrate specificity domain in the multidrug resistance protein. J Biol Chem 274:22877–22883. (2004) Cysteine residues in the organic anion transporter mOAT1. Biochem J 380:283–287. (2001) Detailed characterization of cysteine-less P-glycoprotein reveals subtle pharmacological differences in function from wild-type protein. Br J Pharmacol 134:1609–1618. (2005) Role of the NH2-terminal membrane spanning domain of multidrug resistance protein 1/ABCC1 in protein processing and trafficking. Mol Biol Cell 16:2483–2492. (2004) Identification and characterization of functionally important elements in the multidrug resistance protein 1 COOH-terminal region. J Biol Chem 279:53571–53583. (2003) Identification of the structural and functional boundaries of the multidrug resistance protein 1 cytoplasmic loop 3. Biochemistry 42:14099–14113. (2005) Analysis of human multidrug resistance protein 1 (ABCC1) by matrix-assisted laser desorption ionization/time of flight mass spectrometry: toward identification of leukotriene C4 binding sites. Mol Pharmacol 68:1455–1465. (2003) ATP binding to the first nucleotide binding domain of multidrug resistance-associated protein plays a regulatory role at low nucleotide concentration, whereas ATP hydrolysis at the second plays a dominant role in ATP-dependent leukotriene C4 transport. J Biol Chem 278:30764–30771. (2001a) Identification of an amino acid residue in multidrug resistance protein 1 critical for conferring resistance to anthracyclines. J Biol Chem 276:13231–13239. (2001b) Identification of a nonconserved amino acid residue in multidrug resistance protein 1 important for determining substrate specificity: evidence for functional interaction between transmembrane helices 14 and 17. J Biol Chem 276:34966–34974. (2002) Determinants of the substrate specificity of multidrug resistance protein 1: role of amino acid residues with hydrogen bonding potential in predicted transmembrane helix 17. J Biol Chem 277:20934–20941. (2003) Characterization of the role of polar amino acid residues within predicted transmembrane helix 17 in determining the substrate specificity of multidrug resistance protein 3. Biochemistry 42:9989–10000. (2004) Transmembrane helix 11 of multidrug resistance protein 1 (MRP1/ABCC1): identification of polar amino acids important for substrate specificity and binding of ATP at nucleotide binding domain 1. Biochemistry 43:9413–9425.